Pollock have a history of being severely overfished, especially with the introduction of improved fishing methods. In the early 1990’s the stock was severely depleted, and stocks have not recovered. This report covers management area 4VWX+5 which is primarily the western stock. The total allowable catch for this management area in the 2010-2011 fishing year was 5,900 mt although landings were only 4,926 mt. Pollock are managed by the Department of Fisheries and Oceans (DFO) under an Integrated Fisheries Management Plan (IFMP). Stocks are regulated according to the precautionary approach, and dramatic measures have been implemented to rebuild the stocks since the declines in the 1990’s However there are some concerns that fishing pressure is still too high, as the population status remains depleted. Exact stock status and fishing mortality is unknown as there are uncertainties associated with the last stock assessment of 2009. The Committee on the Status of Endangered Wildlife (COSEWIC) has not determined a status for Canadian Pollock. Otter trawls, bottom longlines, and bottom gillnets are non-selective methods of fishing which cause large amounts of bycatch. Bycatch includes a variety of species of concern such as harbour porpoises, North Atlantic right whales, leatherback turtles, skates, and wolfish amongst others. Otter trawls have the potential to cause significant damage to the habitat. Since cod and Pollock are found in areas with substrates of gravel, rock, or sand, gear damage is limited. Bottom gillnets and bottom longlines cause low levels of damage, but can still snag on corals causing breakage. It is possible that the effects of bottom gear in the cod and Pollock fisheries are underestimated. Pollock catches in New England have declined from a high of almost 25,000 t in 2986, to historic lows of around 5,000 t/ from the mid-1990s. In 2016, total New England commercial catches were 2582 t.
Pollock caught by bottom trawls, set gillnets and handline and pole and line is Not Recommended due to impacts on bycatch. 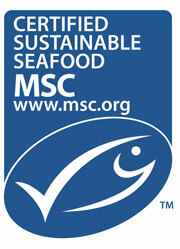 Although the stock is healthy, the fishery also targets overfished Atlantic cod. Trawling takes place over sandy seafloor, and closed areas help to mitigate overall habitat impacts, while seafloor impacts are minimal for handlines and longlines. Management is considered moderately effective because haddock stocks have rebuilt under a comprehensive rebuilding plan that aims to recover other species and reduce bycatch levels. Atlantic Pollock is an important fishery in the US, Canada, Iceland and Norway. 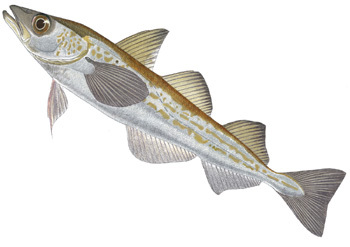 Atlantic Pollock is found on both coasts of the Atlantic Ocean. In the Northwest Atlantic, it is most abundant on the Scotian Shelf and in the Gulf of Maine. Pollock are a long-lived species, but spawn many times in a single year, which may allow quick stock recovery. The Atlantic Pollock were declared overfished in the mid-1990s, but recovered in 2003. Currently, the Atlantic Pollock population is deemed to be recovering in the US and Canada and to be healthy in Norwegian waters. The U.S. portion of the fishery is managed under the Northeast Multispecies Fishery Management Plan (FMP), where time/area closures, gear restrictions, minimum size limits, and direct effort controls are currently in place. Current goals of the management plan include reducing fishing mortality to allow stock recovery. Bottom trawls, and gillnets catch a variety of species, as they are not species-specific. Of particular concern for this fishery, is the capture of marine mammals in gillnets. Bottom trawling is known to have significant impacts on the benthic community, though the severity may range depending on the type of substrate. This recommendation covers walleye pollock (refered to as pollock herein) landed by non-MSC certified Russian mid-water trawl and Danish seine fisheries in the Northwest Pacific, including non-MSC certified Russian mid-water trawl and Danish seine fisheires in the Northwest Pacific, the West Bering Sea, Sea of Okhotsk, and Sea of Japan. The population structure for this species is complex and scientific understanding is evolving. There are seven distinct stocks with targeted fisheries: 1) West Bering, 2) Navarinsk, 3) East Kamchatka, 4) Northest Sea of Okhotsk-West Kamchatka, 5) West Sea of Okhotsk-East Sakhalin, 6) Sea of Japan, and 7) Japanese Pacific. Pollock is a groundfish and a member of the cod family. It occurs in aggregations thoughout the year and is mostly targetd by mid-water trawls. It is one of the largest single-species fisheries in the world, with a total global harvest of 3.2 million tons in 2014. Most of this harvest (92%) is by Russian and Alaskan fleets, with Russian catch slightly exceeding American harvest. Russian pollock accounts for 40% of pollock sold in the US. Most of the regulations and scientific committes for the management of this fishery is housed within the Russian Ministry of Agriculture which determines the annual Total Allowable Catch (TAC) for each fishery. Concerns exist around mangement enforcement, particularily due to illegal discards of juveniles and catch exceeding TAC limits. There are also concerns around lack of data on bycatch impacts. Finally, the strategies for addressing the interactions between the fishery and red-listed Stellar sea lions are considered inadequate.